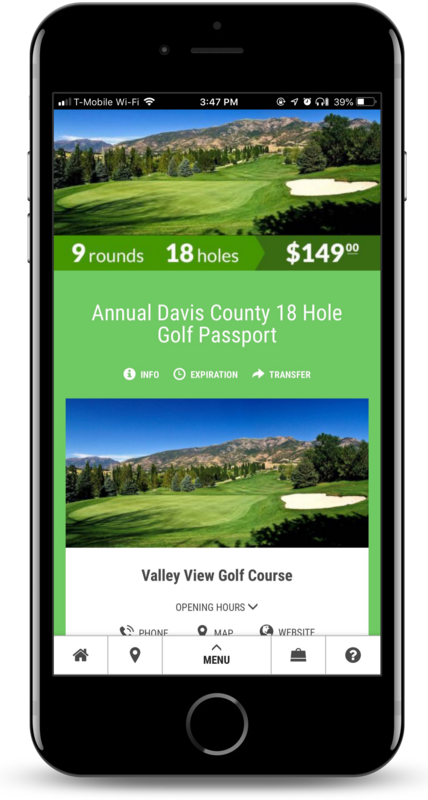 Explore nine Davis County golf courses with one easy-to-use pass – the Davis County Golf Passport. Valid for 365 days after purchase, the pass includes either a 9-hole or 18-hole round of golf at each of these participating courses: Bountiful Ridge, Crane Field, Davis Park, Eaglewood, Glen Eagle, Lakeside, Schneiter's Bluff, Sun Hills, and Valley View. Certain restrictions apply (see below). This is a mobile exclusive pass and you must use your smartphone to redeem your rounds of golf. Premier 18-hole mountain golf course with a spectacular view of Great Salt Lake and valley. This scenic course features cascading waterfalls, large greens, and many forms of wildlife. Rated 4-star and “best value” golf course by Golf Digest. Crane Field is the newest golf course in Davis County! The course features a driving range, modern greens, elevated tees, white sand bunkers, ponds, native wetland features, and wildlife. Other amenities include a driving range with grass and mat tee areas, a beautiful clubhouse, golf shop, electric cart rentals, food, beer and other beverages. Davis Park Golf Course is a public golf course located on the benches of Fruit Heights, Utah. The course has beautiful views of the valley, lake, and mountains. It is known for its smooth putting surfaces and great staff. Nestled along the hillside of the Wasatch mountains this course provides a panoramic view of the valley and the Great Salt Lake. Conveniently located just 7 miles north of downtown Salt Lake City. Includes a driving range, snack bar, large reception lounge, plus motorized and pull carts. Accuracy, not distance is the key when playing this links-style course. Reservations recommended. Voted as a “Top Value” in the PGA Guide to Travel. This beautiful 18-hole course presents many challenges because of various water hazards and small greens. Course is short enough for the beginner to enjoy. Features a large driving range and practice green. Come enjoy the great mountain views and friendly staff. Located near the entrance to Antelope Island and offers great views of the Great Salt Lake, Antelope Island and the Wasatch Mountains. The course is player friendly and ranks among the area’s finest. Includes a beautiful banquet facility and snack bar area. This course is privately owned and was designed by Bruce Summerhayes and built in 1995. Featuring a challenging and fun 18-hole course. The practice area consists of three practice greens, a full-length grass-tee driving range, a practice bunker and a full-service Club House for meetings and receptions. Consistently ranked as one of the top rated public courses in Utah. It’s received Golf Digest’s “Top 75″ public golf courses in America and a 4-star value golf course ranking. Features scenic elevated tees and challenging greens. Offers great hole variety with beautiful views of the Wasatch Mountains and the Great Salt Lake. 1. The golf passport is valid anytime Monday - Friday and AFTER 12:00 PM on weekends and holidays. 2. The golf passport is NOT valid during league or tournament play. 3. Cart is not included. 4. Golf passport is not eligible for use with any other offer. 5. One round per course, per card holder. 6. Tee times based on availability and each facility’s advanced tee time limitations. 1. The golf passport is valid anytime Monday - Friday and AFTER 2:00 PM on weekends and holidays. The Davis County Golf Passport expires 365 days after purchase. Vouchers are redeemable for certain goods, services or experiences offered by, or facilitated through, the Merchant identified on the Voucher. The Merchant is solely responsible for redeeming the Voucher. Furthermore, the Merchant is fully and solely responsible for the care and quality of all goods and services it provides to you and for any and all injuries, illnesses, damages, claims, liabilities and costs (“Liabilities”) it may cause you to suffer, directly or indirectly, in full or in part, whether related to the use or redemption of a Voucher or not. You waive and release Bandwango, Davis County and its subsidiaries, affiliates, partners, officers, directors, employees and agents from any Liabilities arising from or related to any act or omission of a Merchant in connection with your use of a Voucher or the goods, services or experiences a Merchant provides in connection with the Voucher. The Merchant is the sole issuer of the Voucher. Vouchers are not redeemable for cash. Unauthorized or unlawful reproduction, resale, modification or trade of Vouchers is prohibited. Pricing relating to certain Merchant offerings and Products on the site may change at any time in Bandwango and Davis County’s discretion, without notice.